The test prints from imaterialise arrived today, and are of adequate quality (i.e. they aren't inferior to other print houses for the same material). The pricing is definitely competitive with Shapeways; though until I actually work out my mark up would be and other factors, I'm not prepared to elucidate more specifically. There are a few provisos. 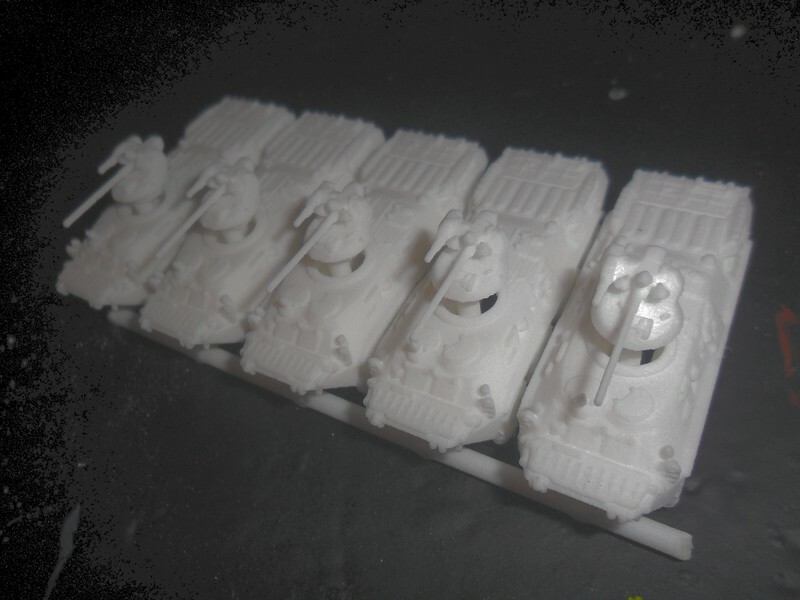 One, imaterialise has a floor price model (which maybe what Shapeways is trying to do), which means that, practically, things will have to be sprued together to get the most out of your money - and they require 3 mm sprues, not 2mm, which means that the six BTR-80As here have proven to be difficult to get off the sprue. Two, and more problematically, something I discovered while starting up the shop process (as a back-up/addition to Shapeways)... They only allow you to sell something you have already printed. Which is kinda of a major problem (imagine having to basically re-buy the entire Shipyards range AGAIN and in groups of three-to-four - at that point, it'd be cheaper to buy a new printer and do it myself), and disappointing. I'm making enquiries. So, I am having another look at Scuplteo, but the prices there are already higher than Shapeways; though single models appear more viable, the one I checked was about 9 euros (by the time I have added my mark-up) instead of 7.5 euros at Shapeways currently. So, not a good alternative, either. At the moment, the [i]Shapeways Shipyards hasn't been affected by the price change yet[/i] - but as I won't be notified when it is, it could be at any day. 2) If WSF was requested, make up a specific file for that order and print it A N Print house (imaterialise or elsewhere) and then ship it to you again and Paypal invoice you. (The problem with THAT is, if I cannot have the package delivered from them to you, you'd have to pay postage twice. 3) For those who don't like WSF higher detail, there may possibly be an option to get printed with someone who kindly made an offer using an optical resin printer (they are going to try one of the models when they get chance and get back to me). I will have to look *sigh* into some sort of social media - possible Facebook - page that has a suitable private mail system with which I can pass along my email address on request (which in the short- to mid-term will be necessary for Paypal invoices and whatnot). 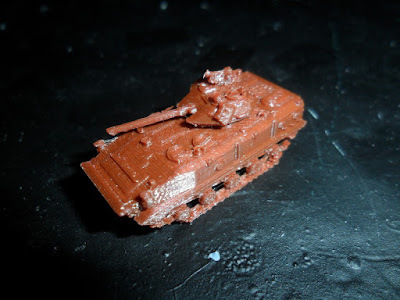 I will also take the opportunity to say that I am still open for commissions, the standard price for a new moderns vehicle (which grants you shared rights to the file so you can print the model yourself however and wherever you like) is £50. So, with that said, while Shapeways *is* still a viable option, I will continue to make releases (not like I have much option at this point! ), so this month's release is the Chinese ZBD-03 in 144th scale. Photo is of the Replicator 2 prototype. 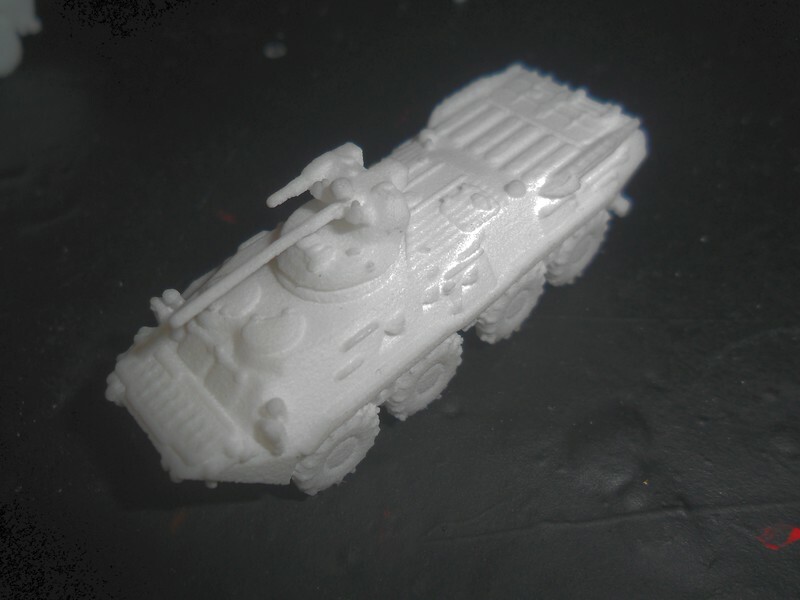 Next month's release is - pending the priceapocalypse - likely to be either the Luchs (as designed by UshCha) or the BRDM-1. (I am also working on a Toyota Hilux technical presently.) But for the moment, it is, I'm afraid, a case of keeping you posted as the situation develops. We will be attending ChillCon in Derby this weekend (in lieu of the Worlds); we'll see how that goes!